Yesterday, people involved in the campaign to save Bilston Glen sent an update stating, “We have new information from the Midlothian Council and it would seem likely that the road is being redirected along a different route, one that does not go through Bilston Glen. We have a map of the alternative route and it makes a lot more sense than any of the plans that we had seen before. We will not know until the spring what plan has been finalized for the road. They are also planning a lot of other development in the area so it is possible that the glen might still be under threat even if the proposed development is not the road. The tree village is open for visiting and staying. Help is always needed in a variety of ways, from donating funds and supplies to attending Sunday Free Cafes in the glen and participating in the public outreach, education and demonstrations against the development in Midlothian Scotland. Photo taken by Nettle while living on-site in 2004. 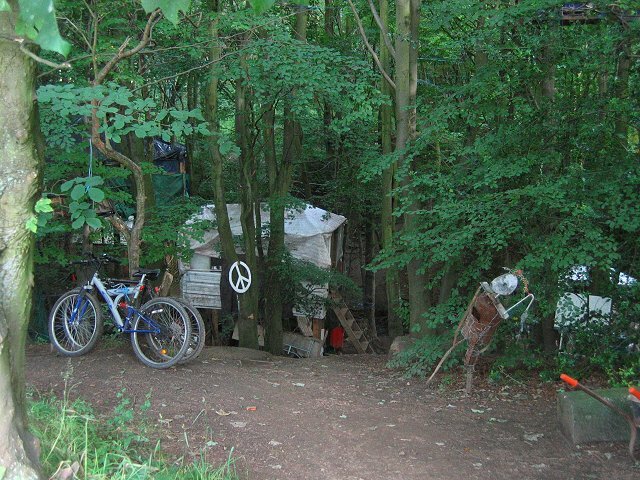 Since June 2002 Bilston Glen, located near Penicuik, Scotland about eight miles from the city of Edinburgh, has been occupied and fortified by an ever-expanding group of multinational environmental activists. The Bilston Glen Anti-Bypass Protest Site began when a proposal to build a road through the glen was put on the table by biotech giant Bayer. At the time, Bayer was building big dreams around commercial farming of genetically modified foods (GMOs) in the UK. While Bayer was dreaming, we were scheming. A strong anti-GMO movement in the UK attacked the biotech industry from every angle – slashing crop fields and test sights, protesting universities funding the research for further development, staging large public demonstrations outside grocery stores demanding the labeling of GMOs on consumer products, and last but not least – attacking the infrastructure of industrial development – the roads that would lead to commercial farm lands. A tree village in an ancient woodland, Bilston Glen remains protected and a home to many. So far the activism exposing GMOs for the evils they are has worked in many parts of the world. To this day, commercial farming of GMOs is illegal in the UK, and by European law, food products containing more than .9% of a GM or GE ingredient must be labeled as containing GMOs. However, these victories did not get the proposal for the road off the Midlothian council agenda. After Bayer was no longer funding the road, a large “industrial estate” near to the glen where Ikea and other large “box” stores and packaging facilities reside took up the bid to fund the road. The new investors meet uproars from the community, who for many reasons feel that the road is needless and are opposed to industrial development through the ancient woodland. Bilston Glen is not only a designated “Sight of Scientific Special Interest” (SSSI) – a conservation designation denoting a protected area in the UK – it is also apart of the Green Belt. The Green Belt was designated as a cooridor for wildlife in the Midlothian area of Scotland, it’s purpose is to prevent development along the belt line. With blatent disregard to these already protected areas, the local council itself became the face of the road expansion. Luckily, Earth warriors, forest squatters, world travelers, Earth First!ers and the like have done an amazing job at preventing road expansion through Bilston Glen for over 10 years! 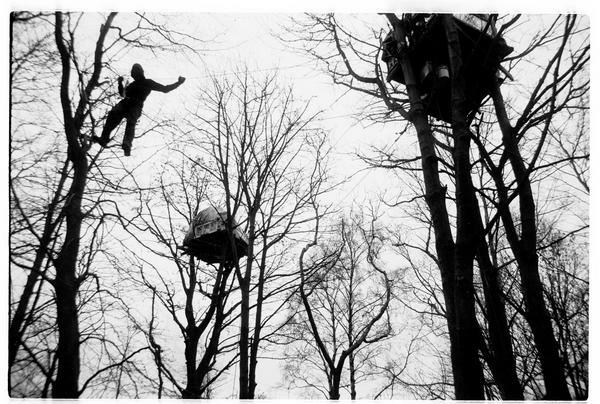 The tree-sit is the one of the longest standing peace and solidarity projects in the world, along side The Fasland Peace Camp, which is also located in Scotland. 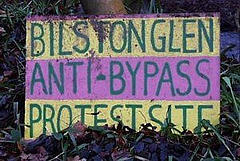 Intent on blocking any attempts to build a road through Bilston Glen, residents are also doing a alternative lifestyle project. Living and working together, organising ourselves and co-operatively helping each other. Im so glad that the people there have such resolute spirits. They are brave, and inspiring. Yet these types of things are not going to stop biotic collapse. Tree sits take a long time, and save relatively small spaces of land, which is extremely important for they are beings homes, many endangered. Yet we dont have time, time is almost up, we need strategic underground militant action aimed at key points of industrial infrastructure, and soon!